Jessica Lewis is a student at Georgia Southern who, just like everyone at her university last week, was preparing to leave Statesboro ahead of Hurricane Irma. On Thursday afternoon, she had just one class left, (a Political Science seminar) and already had her stuff packed and in her car, so she could head home to Atlanta straight away as her class the next day was cancelled. But there was one outstanding issue: her dog Luna. “I was trying to figure out the easiest and quickest way to her because obviously I wasn’t leaving her there, and I was doing my best to get ahead of the traffic because all of Florida and Coastal Georgia was evacuating north/west,” she told Mashable. Lewis also attached several pictures of Luna to win him over with her cuteness. As it turned out, there was no need. 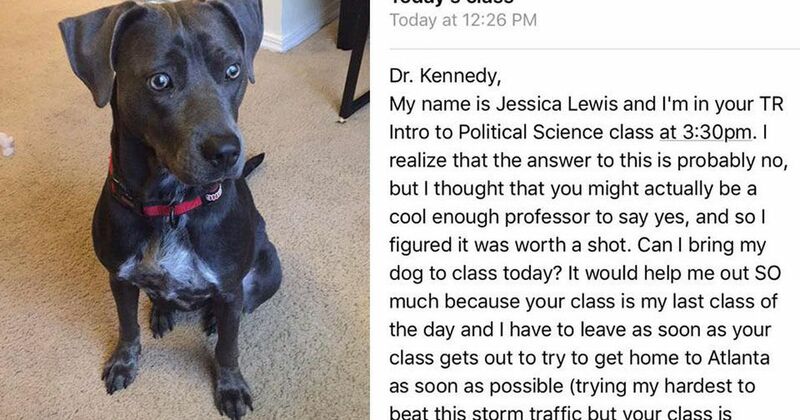 Her teacher, Prof Joshua Kennedy, is a dog lover and replied with a positive response: “He responded in literally a minute and I pretty much screamed and ran outside to show my roommate,” Lewis, a double major in Political Science and Arabic, said. So Luna went, and she behaved pretty well. She’s such a good doggo! “She’s actually awful on a leash and we’ve had a hard time training her with it, so she dragged me across campus on the way there, but once we got there and she was in the classroom no one had a single complaint about her. She loved it,” Lewis recalled. “She just walked around the classroom and got pets from everyone and made friends. The students were overall pretty excited about it when they saw her. They just took notes while they petted her and we all laughed together (professor included) when she did something funny,” Lewis added. At the moment, Lewis is in a small town outside of Atlanta, as Georgia Southern University decided not to resume classes until Monday. “There was no damage to my family’s home up here and as far as I know my apartment in Statesboro is safe and we haven’t been given many updates on the actual condition of the school, but considering classes will resume Monday, I can’t imagine it’s too bad at all.